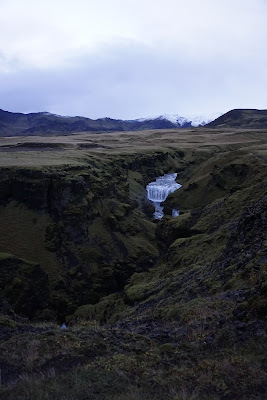 One of the dozen waterfalls beyond Skogafoss. 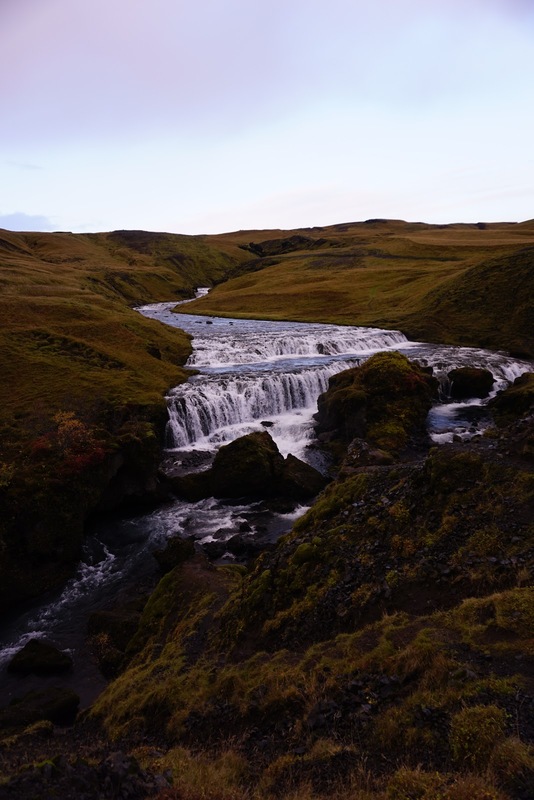 One thing Iceland certainly doesn't have a shortage of is breathtaking waterfalls. There are super tall waterfalls, extremely wide waterfalls, multi-tiered waterfalls, brightly colored waterfalls, remote waterfalls, all sorts of incredible sights to see. But as we discovered when hiking to Glymur, often, following the trail beyond an easy-to-spot waterfall in Iceland can get you to even more incredible scenery. The hike to Glymur took us to Iceland's second tallest waterfall on our recent trip there, but we had Skógafoss on our list for our tour through the country's southwestern region. 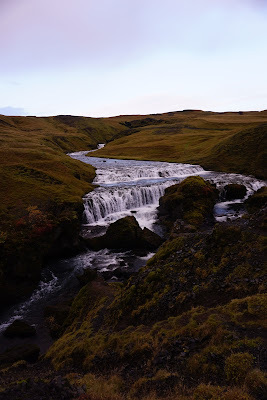 You can see Skógafoss from the Ring Road, but as we learned when we arrived, there's so much more beyond the waterfall itself worth exploring (that we ended up not having enough time for). Skógafoss sits along the Skóga river, and the cliffs Skógafoss tumbles down from actually used to be sea cliffs. The ocean now sits a few miles away. It's one of the wider waterfalls in the vicinity, measuring approximately 50 feet across and with a 200-foot drop. 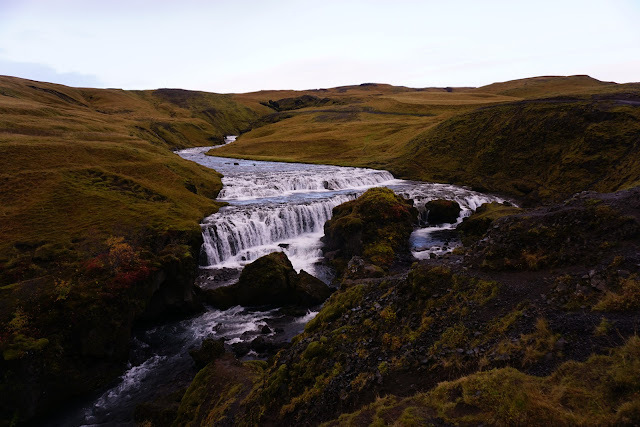 The parking lot for the waterfall is located here, and also happens to be home to one of the few campgrounds in Iceland's southwest that's open year-round. We arrived late afternoon and spent the night there. Don't be alarmed if the parking lot looks crowded - the trail beyond the falls isn't. It's pretty hard to miss the waterfall, and the trail begins following a set of stairs up the right side. We spent some time exploring near the bottom of Skógafoss before we started up; if you're going to get close to the falls, you're going to get wet! 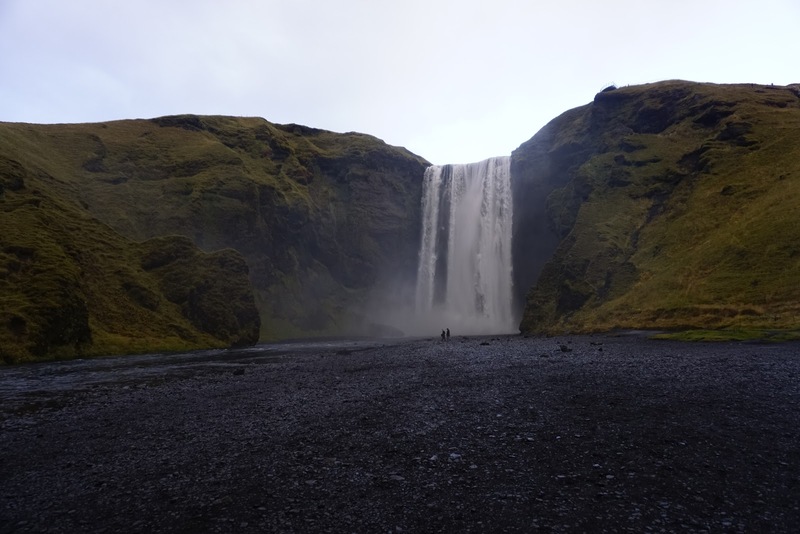 Skógafoss, with two teeny tiny people for scale! I was standing near the parking lot taking this shot. And then, up we went. The stairs are sturdy, but rusty and slippery, and also quite steep in sections. I was grateful for the handrail in some places, though the handrail was only available on one side. On the other side, the railing was either completely absent, or a rope between metal posts. We made it up what felt like at least a million stairs, and it was incredible to look down at the waterfall, and beyond to the ocean. But an obvious trail had also appeared at the top of the falls, one we hadn't on maps or in the research I'd done, and decided to follow it. Another waterfall beyond Skógafoss. At this point in our hike, it was getting pretty dark out! Turns out, we'd started along the Fimmvörðuháls (Fimm) trail, a 25km (15.5mi) point to point hike that ends in Thórsmörk. When I learned about the Fimmvörðuháls trail, which happened to be after we got back, I had a "dammit!!" moment, thinking how amazing it would've been to have baked more time in our itinerary to go at least halfway. Sun was starting to set, making for some pretty dark, moody scenery! We started the climb up the Skógafoss stairs around 4pm, and in October, it's dark by 7pm, which didn't leave us enough time to go too far. We climbed up and up, our sights set on a grass-covered rocky outcropping that blocked our view of whatever was beyond, and made that our turnaround point. Looking back toward the parking lot from where we came near our turnaround point. The sun was quickly setting, but we could still see a few snow-capped peaks to the west, and more trail leading beyond where we'd decided to turn around. Past the snow-capped peaks sits the Eyjafjallajökull volcano, which erupted in 2010. We hadn't packed gear or clothing for a night hike, but if we'd arrived earlier, or been there in the summer, I have no doubt we'd have followed it further. We retraced our steps, arriving back at our Campeasy camper van just before I it was dark enough to prevent me from being able to clearly see my feet. Definitely getting dark toward the end of our hike! One of the toughest parts for me about planning a seven-day trip to Iceland was how to fit everything in, and to be honest, it's impossible. I could spend a month there and still not get to all of the places I'd want to visit. As a Type A personality, and as someone who prides themselves on their planning abilities, it was a tough pill to swallow! I didn't learn about the Fimm hike until after we got home, but you have to hike it as a 50km (30 mile) out-and-back, or you have a 4WD vehicle waiting for you at the other end. If you do want to continue beyond where we turned around, and I wish we had, this page is a great resource. 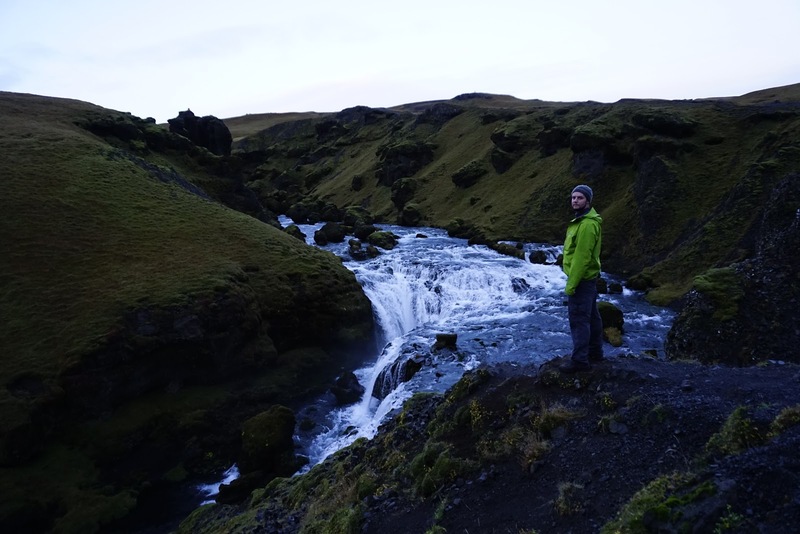 But if you're just heading to Skógafoss, it's a piece of cake to find, parking is obvious, and the trail itself is obvious. I'd suggest sturdy, waterproof hiking boots and layers, as weather can change in an instant in Iceland and parts of the trail were muddy and slippery. I also took Sh!t Kits with me, as there aren't any facilities beyond the parking lot unless you're going a good long way, and snacks from a Trailfoody bag. 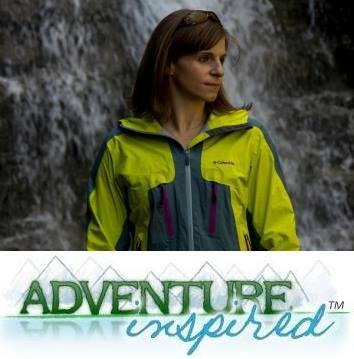 Who's been to Iceland and has hiking tips to share? 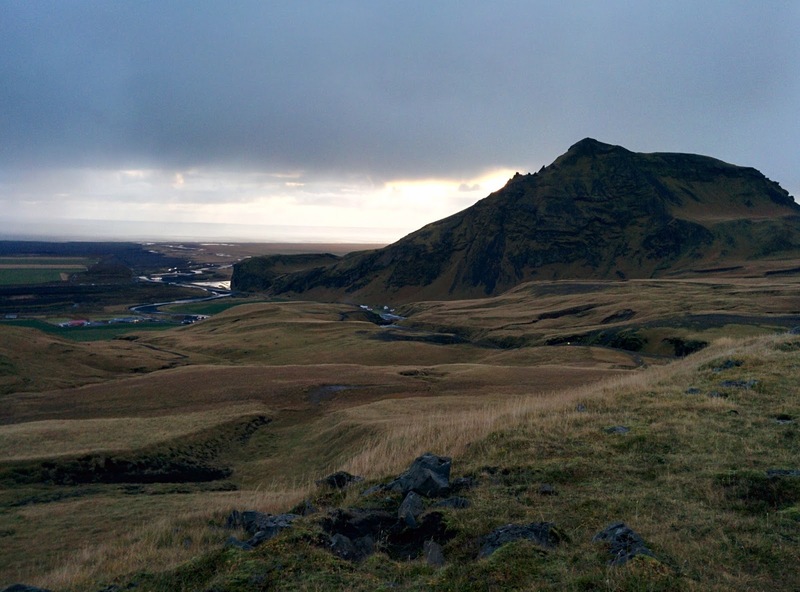 Who's done this hike, either to Skógafoss or the whole Fimmvörðuháls (Fimm) Hike? If you haven't, think this is one you'd want to try? I'd love to hear from you!